Tonight I'm drinking Young's Double Chocolate Stout brewed by Wells & Young's Brewing Company in Bedford, UK. I reviewed this about two years ago as well, but it's been a while. In addition, one of my first guests reviewed this beer in October, 2009. I haven't kept in touch with Cynthia, but she gave a fun presentation back then. The label/can design has changed a little since those reviews as well, most noticeably the severe lack of orange involved. There is still plenty of that regal purple along with the headline "Pure Luxury" at the top though. Best before 2/26/2011. Whew! 330 mL/11.2 oz. 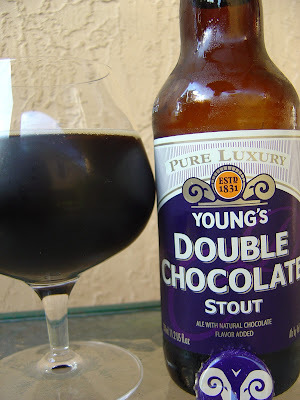 Rich chocolate aroma with hints of vanilla. Roasted chocolate flavors kick things off, very malty. Not nearly as sweet or thick as I remembered it to be. The middle is hoppy and creamy, perfectly balanced. Cereal flavors and texture, perhaps with smoky nuances, come toward the end. The 5.2% alcohol is a non-factor. On the watery side, sadly. An enjoyable and simple beer that I would not describe with the description "pure luxury". Still, you should give it a whirl! Such a bold statement - 'Pure Luxury'. I think it's a pretty cool tag line. Wish I thought of it for them. That is actually very tame compared to some bottle claims that I will not rattle off here.